Congratulations to "Trish J", the winner of Amy's giveaway. Thank you to all who participated! A year ago, I had eleven kids in my dining room making gingerbread houses out of graham crackers. Their moms are all friends of mine, who came for the wine and the company more than the masterpieces that would inevitably be constructed. It was good fun, save for a significant structural issue. The houses wouldn’t stay together, their sugared joints sliding under the pressure of grubby hands and gumdrops. They looked like little FEMA houses, decorated for the holidays despite the hardships they had endured. Later in the evening, the kids were running laps around my house, the soles of their shoes stuffed with icing and sprinkles. We moms settled, victorious for having survived the hour of unabashed creativity, onto couches that had been downright stylish when my husband and I got married ten years before. “I’m writing a book,” I said, my arm draped across the back of the sofa in a casual I’m an author now pose. “You are not!” said my friend Patty, waving her hand. Twelve thousand words. That was a ridiculous amount to me. I had written twelve thousand words! Now, in case you’re not familiar, your standard serial romance novel is sixty to ninety thousand words. A stand-alone title is usually upwards of a hundred thousand, with many topping the two hundred-thousand-word mark. My twelve thousand words were the proverbial drop in the bucket, but it was enough for me, because by that point I could imagine the bucket someday being full. Heck, I could imagine it overflowing. This year, we won’t be making gingerbread houses, but some upside-down-ice-cream-cone-turned-Christmas-tree construction that Heather saw on Pinterest. I have to say I’m relieved. My twelve thousand words eventually turned into my forty-seven thousand five hundred-word novel Meant for Her. It’s a bit shorter than my mother would like (or so she keeps telling me) but well-reviewed and something I’m proud to say I wrote. I also have a related Christmas story out called Love’s Greatest Gift, and I’m working on the third novel in the Love & Danger series, which I hope to have completed this winter. It’s Gwen’s story, the aunt of the heroine from Meant for Her. She is by far the fan favorite, with a generous and quirky spirit that’s keeping me company while I write. Do you have any crafty plans for the holidays, or funny stories of gingerbread gone awry? I’m giving away an e-copy of Meant for Her to one lucky commenter! Ordered to the scene of a fiery homicide, Navy officer Hank Jared wants nothing more than to wrap it up and get to his sister's wedding. His sense of duty won't let him walk away from a case, even if he can't figure out why his boss insisted he handle this one personally. When the key to a safe deposit box is found among the ashes, Hank finds himself staring at two pieces of paper--on one is a coded message, on the other, a name that will change the course of his entire life. Julie Trueblood wouldn't trust a Navy man if he handed her a life jacket on board a sinking ship. Her father was a cryptologist for the Navy, who went into hiding a decade earlier to avoid charges of treason. In his absence, Julie was harassed and interrogated by Naval officers who believed she was a traitor, just like her father. Hank tracks Julie down and confronts her with the cipher. She can't stand what he represents and sends him away, insisting she knows nothing about the message. But when she realizes someone is after her, Hank is the only person she can ask for help. He finds the perfect place to hide Julie, right by his side, pretending to be his girlfriend at his sister's wedding. Now he just needs to remember their relationship is all an act. 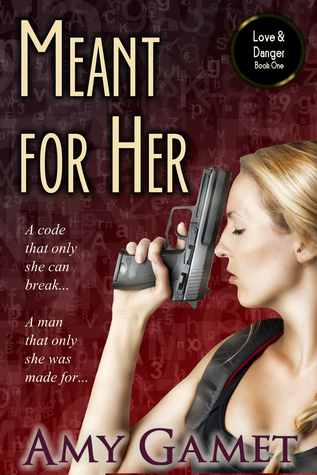 The coded message brings Hank and Julie together, but its secrets hold the power to tear them apart. Guided by her generous and quirky Aunt Gwen, Julie will gather the courage to unravel the cipher that was meant for her to decode, as she learns to trust the man she was meant to love. He hadn’t meant to kiss her. She had been playing games with him, flirting and retreating, and Hank didn’t like games. While she was in the bathroom, he made the decision to keep their relationship professional. He had no intention of jeopardizing his career for Julie Trueblood. That was, until she opened the bathroom door and he saw her body silhouetted in the light of the doorway, the thin fabric of her pajamas teasing him like the sexiest lingerie. His body’s response had been instantaneous. This woman made him feel like he was in high school, all hormones and raging lust. He might die if he couldn’t get close to her, couldn’t rub her smooth skin and feel her body pressed against him. Her chin lifted in denial and she opened her mouth to speak. He didn’t want to hear it. He was tired, he was aggravated, and he was bordering on crazy. He sank down on his makeshift bed before she could pretend she wasn’t on fire, just like he was. The carpeted floor was rigid beneath Hank’s frustrated form, and he punched the pillow in an attempt to get comfortable. He imagined resting his head on Julie’s soft breasts instead, and knew that sleep would be hard to come by this evening. Giveaway ends 11:59pm EST Dec. 13th. Please supply your email in the post. You may use spaces or full text for security. (ex. jsmith at gmail dot com) If you do not wish to supply your email, or have trouble posting, please email maureen@justromanticsuspense.com with a subject title of JRS GIVEAWAY to be entered in the current giveaway. Christmas cards!! Funny you should mention that. I was doing mine at 10:00 last night under duress from my husband, uploading miscellaneous picks from January through August onto Walmart.com (my picks from September through today are sitting on my digital camera). I have a fifteen month-old, and it looks suspiciously like he he's only aged a few months since LAST Christmas! Oh well. I just reminded myself that no one cares about my Christmas card anyway!! Good luck with your decorating! My daughter loves snow globes. She breaks one every year! The magical spread of glass shards and glitter on a hardwood floor. :) I hope yours last longer than mine do! Don't make or bake stuff. Nice excerpt. I do not recall ever making a gingerbread house... I will have to try the graham cracker idea with my little nephew... that would be fun for him... for me I need to finish up a few ornaments I am painting... :) HAPPY HOLIDAYS! MAKE THE ICING REALLY THICK! Someone else I know had good luck using 8 oz. milk containers as a "frame". Except then they looked like milk containers masquerading as a sad little gingerbread house. :( Good luck! My craft muse has taken an extended vacation! My daughter, however, has been learning how to quilt this year and while I don't have any actual quilts, I have some wonderful table toppers, table runners, and place mats. She's also made Christmas trees, an acorn & pumpkin, and Kleenex tissue holders/covers. And they are all gorgeous!! Amy's a new author to me - sound like good reads to add to the wish list. Merry Christmas! Your daughter's quilts sound very pretty! Now I'm wondering what my kids will choose to make when they're older. Right now they're pretty focused on making messes, LOL. I was supposed to make a gingerbread house when I was in grade school. I ended up eating all the candies and left the gingerbread alone. I think you were on to something. I've been making Christmas treats - not gingerbread houses - that's about as craft as I got this Christmas. Where I live, we're usually up to our eyeballs in snow by now. We have nothing this year, just rain. It doesn't even feel like Christmas, so I've been late in decorating, baking, you name it. I'm going to try to get in the spirit before it skips right over me! I just read this and was completely convinced my friend Maria from high school must have found my guest post and commented on it! But you're not her, which is too funny. I try to remember to open her card over the garbage can so all the excess glitter doesn't end up everywhere. They sure are pretty, though!